Some projects present multiple challenges, any one of which could prevent the project from going ahead. We have the skills to overcome them. We were commissioned by Devon County Council to investigate a problem at Landkey Primary School in Barnstaple. Since its construction in 1997, the building had suffered from water dripping through the ceilings into the classrooms. Our building surveyors found that the problem was poor insulation design in the roof, allowing condensation to run down. It required an extensive repair, as all of the tiles would need to be removed to gain access. Our first challenge was the timescale. Ideally a job like this would begin on site in May and take 16 weeks. However, we first became involved in June, and a late summer start on site would cause delays from coping with an occupied school and winter weather. The budget allocation would expire at the end of the following March. The second problem was in securing a contractor. The Council’s framework contractor had decided that to take on such a large job in an occupied school in a short timescale was an unacceptable contract risk. This stopped the project in its tracks. We were unwilling to let the school miss the available budget. Our project manager and in-house CDM co-ordinators set about a collaborative process of re-designing the scheme. 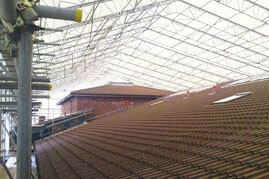 A scaffolding structure would be required to temporarily enclose the building and keep the weather out. Very strict health and safety requirements were set, as the job involved not only working in an occupied school, but working directly above occupied classrooms. After extensive negotiation with the contractor and the school, we were able to propose a 24 week programme for the repair. It was in phases, 2 classrooms at a time, with work stopping during exam periods. The contractor was willing to accept the repair scheme, and we were able to reassure the school governors that there would be no risk to the children. The scheme went ahead successfully, with excellent feedback from the school about our management of the process.